So today we will be looking at how to make a closed terrarium, this includes the most needed information on which plants are actually best suited for a closed terrarium too. Firstly, which plants are best suited for a closed terrarium? Fern, moss, and other houseplants that require a humid, moist environment. Tropical plants varieties like orchids and even air plants. A closed terrarium mimics the environment needed for these plants; a humid and sheltered tropical environment. A closed terrarium allows the circulation of water but it must be opened once a week to remove excess moisture from the air and walls of the container to prevent the growth of mold that can damage the plants and taint the sides of the terrarium. Ensure you acquire a special soil mix to ensure good growing conditions as well as reducing the risk of microbial damage. So let's start putting this thing together! We always begin with lining the bottom of the terrarium with one or two inches of pebbles. Next, apply a layer of charcoal over the pebbles. This helps limit mold and odor. Now we add the soil, about two or three inches. Take your plants out of their pots and gently remove as much soil from their roots as possible. Place each plant in the terrarium and sprinkle some soil to cover their roots. For closed terrariums you can add moss over the soil, just for aesthetic reasons. 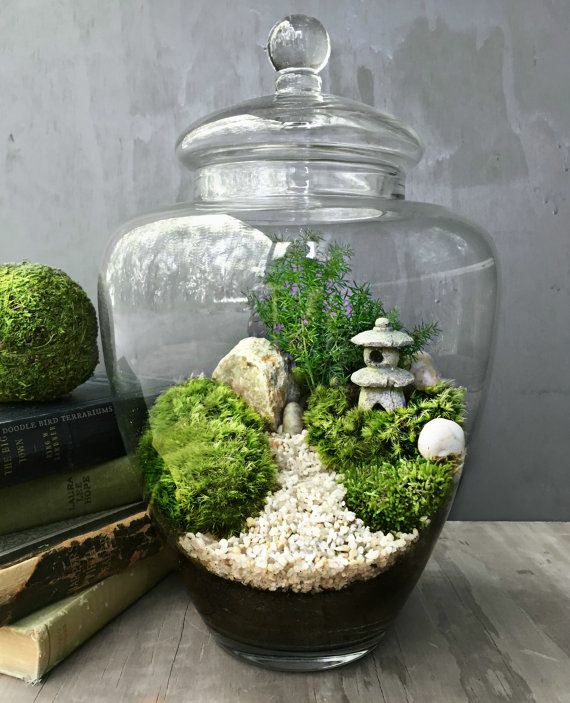 A simple terrarium is now done, but you can decorate your terrarium if you wish, using miniature figures, lights, or stones. Make sure everything is moisture-proof to ensure nothing molds. Maintain your terrarium by misting your plants but only when they look like they may need a bit of a helping hand, because closed terrariums should do well on their own via the eco system created. Place the terrarium in a place where it get just the right amount of sunlight- not directly in sunlight. If you get any dead leaves, just trim them off so that the rest of the plant stays healthy.